Cliff failures pose a threat to humans, the land and the environment. New shoreline and building setbacks are needed now. 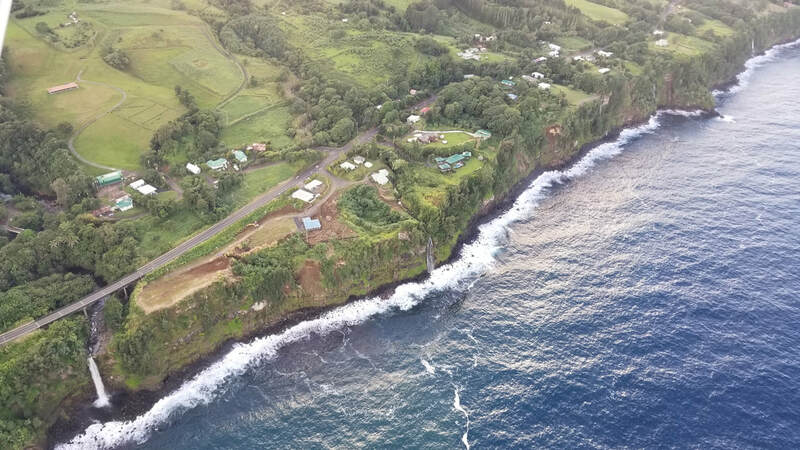 Photo taken by private pilot-photographer on January 6, 2019 overlooking a Umauma property, complete with significant cliff failure. Cliffs along the Hāmākua Coast are subject to failure. 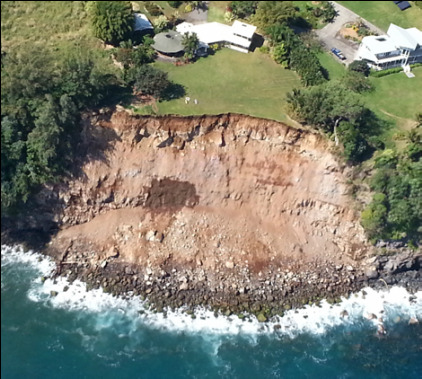 Cliffs along the Hāmākua Coast are subject to failure and erosion hazards from undercutting of the cliffs by waves, and slumping from absorption and release of groundwater. 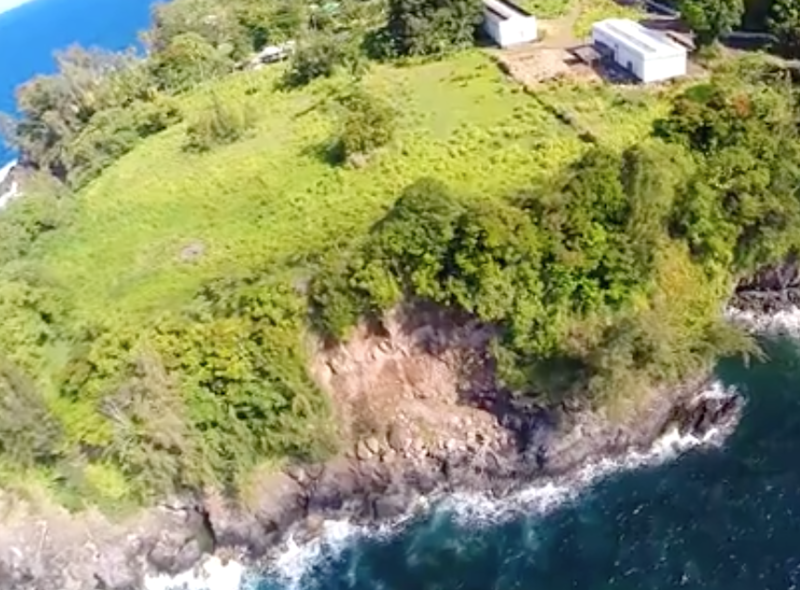 The fragile cliffs pose a major challenge for development. Episodic failure can remove 30-100 feet in one event. These types of episodic failures are not only hard to predict, they are impossible to mitigate. Once a failure occurs there is very little a homeowner can do to regain that land. Note the gushing water coming out of the sides of the cliff, like a large pipe. Photo taken by a private pilot-photographer on September 2, 2018. The entire Hāmākua coastal area, from north of the Wailuku River to Honokaa, is characterized by a mantling of deeply weathered volcanic ash deposits, known varously as the "Pahala" or "Homelani" Ash, which in turn overlie deeply weathered lava flows from Mauna Kea volcano (Buchanan-Banks, 1983; Wentworth, 1938) ... Wherever mechanically disturbed, however, these ash deposits become structurally unstable (Wieczorek and others, 1982), and are subject to "thixotropic" behavior (ability to convert from stable solids to viscous, mobile fluids when under load pressure or on steepened slopes). Eroding bluffs or scarps often show vegetation roots or recent debris at the base of a cliff. Moisture seeping out of a clay or dirt bank is also a sign of erosion potential. Notches or indentations at the base of a cliff, living or dead trees on the open beach can indicate undercutting by waves. Vertical banks, often at the seaward edge of vegetation, anywhere from one foot to several feet high; or vegetation, rocks or structures that are falling over. The vertical cliffs of the Hamakau Coast viewed here from about the Mile Marker 19 looking north. Photo courtesy of a private pilot-photographer, taken on October 21, 2018. The sediment load in the water kills marine life by suffocation and may contribute agricultural chemicals, harmful to sedentary animals and algae. The slide destroys and permanently alters the habitat. Recruitment of species won’t occur for a very long time, and may never occur again. An example of this is the loss of `opihi (mollusk) and wana (sea urchin) fishing grounds along the coast. Local divers have noticed a thin veneer of silt in the turf algae covering the boulders characteristic of the Hāmākua nearshore habitat. 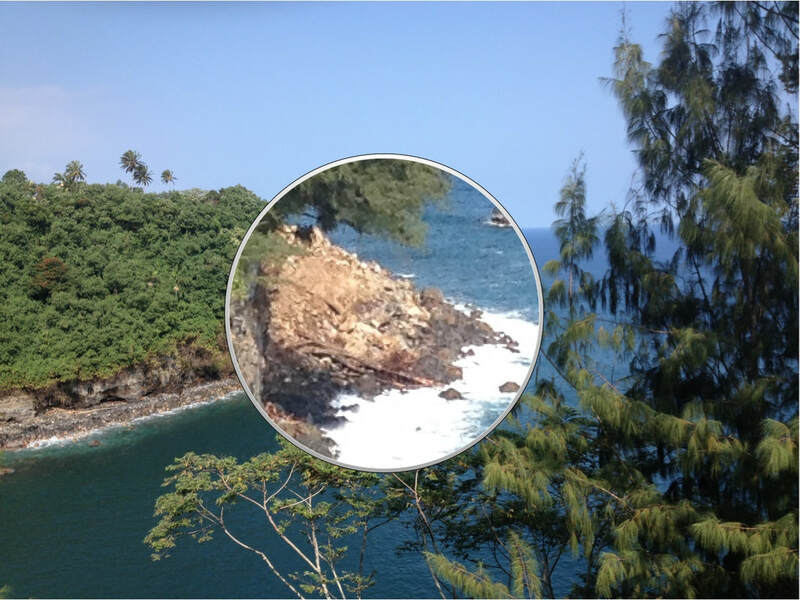 ​Good descriptions of the impact of cliff failures on marine life are included in Dr. Robert Nishimoto's articles in the Hāmākua Times: "Hāmākua Cliff Slides and the Hawksbill Turtle: The Perfect Storm” and "The Lonely Life of the Hāmākua `Opihi". Detail of side view of January 2015 Cliff Failure immediately north of Hakalau Bay at about the 16 mile marker, showing debris including rocks, dirt and trees. As of September 2018, this slide is still causing harm to the environment. Photo courtesy of Cal Motoda. Photo courtesy of Calvin Motoda, 1/12/2015. Amend and/ or create County Codes and Planning Department Rules to develop shoreline and building setbacks to address environmental, health, and safety priorities. 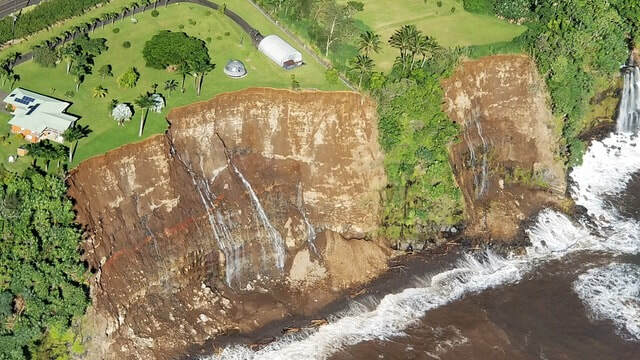 ​Much work remains to develop objective guidelines for determining and defining the " top of cliff", and to establish revised building setbacks which include a lateral safety buffer distance equal to the anticipated 100 years of erosion based on a coastal erosion study. A private pilot-photographer took the pictures below on February 25 and March 29, 2019 (from 2,500 feet). Photographs taken at sea level looking back at the cliffs were provided by retired marine biologist Robert Nishimoto, PhD. in March 2018. They provide another perspective of the extensive cliff erosion and cliff failures from Kolekole to Ninole.